We are in the business of making your floors and surfaces look great, whether it is installing, repairing, or complete restoration. Our goal is to provide you with superior customer service, outstanding results, and a complete line of products to keep your natural stone, clay, ceramic and paver surfaces always looking their best! Our installation and restoration services include hardwood floors and we install carpet, too. 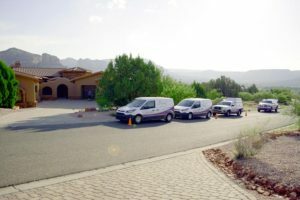 Having been in business here in Arizona for over 40 years, we have certainly worked on a lot of beautiful floors, patios and counter tops. So let us give you a free estimate on your next project. Looking to do some care and maintenance of your stone and tile? Look at our line of Do-it-Yourself kits for those of you looking to do the work your self and save money. Please check out our new kits in our on line store. Are you in the Phoenix, Tempe, Scottsdale area? Send us a message or give us a call today at (602) 993-9800 for your free, no obligation consultations for installation of tile, wood, carpet and stone as well as restoration of your interior and exterior stone, grout, clay tiles and paver surfaces.